Maintaining a well-presented, clean and hygienic environment at all times can be challenging. 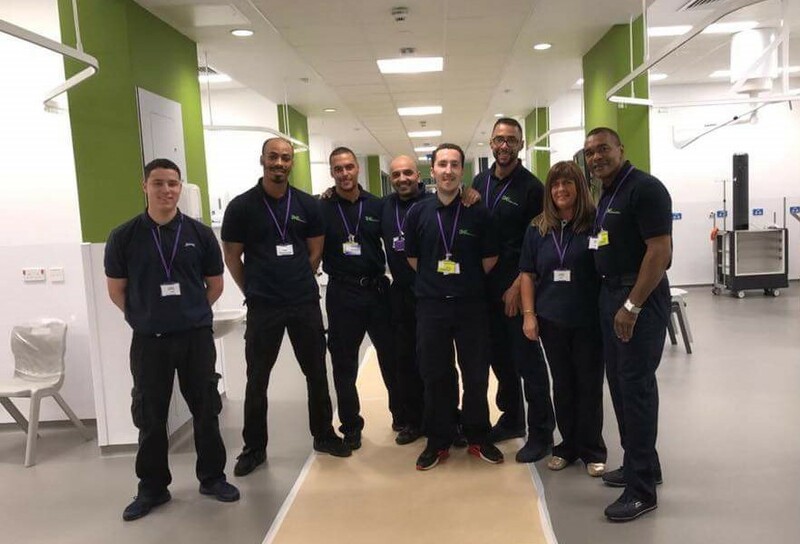 EETD works with businesses across the UK to provide specialist cleaning services for all aspects of your working environment from floor and kitchen cleaning to window cleaning, builders’ cleans and specialist clinical cleaning. Our team of professionally trained and work to the highest standards at times to suit your business and specific needs to minimise any disruption. Our cleans are designed to tackle even the toughest jobs, getting into those hard-to-reach places to ensure a thorough cleanse and sparkling finish to reduce the spread of germs and improve the appearance of your working environment. Every business has a duty of care to protect their customers and staff from the everyday dirt and germs that could threaten their health. However, maintaining a clean, hygienic and sanitary working environment is an ongoing job. Areas like washrooms and kitchens can quickly and easily harbour dirt and germs like E. coli and Salmonella in hard-to-reach places and create health hazards for customers and staff. Sickness caused by an unsanitary environment can be costly to a business in many ways, losing them customers and staff and often damaging their reputation for good. regular services, tailored to your exact needs so we can come at times and days to suit you and your customers. With vast experience across a wide range of sectors, we pride ourselves on providing a reliable, professional and flexible cleaning service to our customers. equipment to ensure you meet those vital industry standards at all times. You can call us, we can visit you or send you further information. We understand you may want to compare prices and ensure our products do the job. Lemon Fresh is a general-purpose anti-bacterial disinfectant with a fresh lemon fragrance. Suitable for use in toilets, washrooms and all areas where a high standard of hygiene is important, it is ideal for cleaning and deodorising in walls, floors, tiles, fittings, drains and dustbins. Use for mopping, damp wiping, spray cleaning and deep cleaning applications. pH 3.5. Bactericidal data: BS.EN.1276 Accredited To download printable Trigger Spray Labels please click on Product Information. Premier Screen is an innovative, fully biodegradable, concentrated disinfectant cleaner with powerful virucidal, bactericidal and fungicidal properties. It uses sophisticated chemical technology to kill harmful bacteria and viruses and can be used for a wide range of environments and surfaces, such as washrooms, showers and around swimming pools. Its powerful formula deep cleans and deodorises as well as killing microbes including HIV, Hepatitis B, Athlete’s Foot and MRSA, making it ideal for use in Healthcare environments and infection control. Use for mopping, damp wiping, spray cleaning and deep cleaning applications on all hard surfaces and floors. Also suitable for clinical cleaning and disinfection. Freshaloo: A 2 in 1 daily toilet cleaner that effectively cleans and deodorises your toilet or urinal. Its viscous formulation clings to the inside of your loo for maximum cleaning power. With a fresh spring fragrance Freshaloo leaves your loo sparkling and smelling fresh, crisp and clean. MP9 is a top performance, powerful concentrated cleaner for use on all hard surfaces, cutting through even the most stubborn oil and grease. Whether on a small or large scale, your surface is left clean and fresh. Suitable for use on plastic, laminate, ceramic, glass, metal and painted surfaces, MP9 offers powerful cleaning with minimal effort. Its concentrated formula means that just 5 litres will cover 3750m² when damp mopping at 1:150 dilution *not suitable for use on terrazzo. MP10: An odorless multi purpose cleaner and degreaser. Suitable for catering areas. A highly effective, multi-purpose alkaline cleaner. Removes oil and grease. For all hard floor surfaces except terrazzo. Also for plastic, laminate, ceramic, glass, metal, stainless steel and painted surfaces. Versatile for large and small tasks. MP10: is an iconic floor cleaner in the Premiere range which is ideal for both small and large cleaning tasks. Suitable for use on plastic, laminate, ceramic, glass, metal and painted surfaces*, MP10 effectively removes oil and grease and general dirt, and has a fresh clean fragrance. Premier Force: Is a powerful anti-bacterial cleaner and degreaser that will cut through even the most substantial build up of oil and grease. With its unfragranced formulation, Force is perfect for use in all catering environments, as well as being ideal for use on safety flooring and appliances. Surfaces are left hygienically clean. Especially powerful in removing soot and grime caused by fire damage. Bactericidal Data: 99.999% kill results against E. coli, S. aurous & E. hirae at 1:50 dilution in 5 minutes contact. Premiere Machine Dish wash Liquid 300: A high performance commercial dishwasher detergent suitable for most types of crockery, utensils and pans, formulated for use in dispensing systems on commercial dishwashing machines. Containing caustic, alkali builders and water softeners for maximum efficiency, it effectively removes food and tannin stains. DO NOT allow contact with zinc, brass, aluminum or galvanized metal surfaces. Machine Dish wash 300 contains a corrosion inhibitor to protect your machines internal components. Suitable for use in soft to medium water areas. Rinse Aid: Is a liquid rinse additive for use in automatic dishwashing machines which helps to reduce drying time and finishes the cleaning cycle provided by machine dishwashing detergents. The effective formulation prevents streaking on crockery and glass, leaving crockery and glassware spotless and sparkling. Suitable for both hard and soft water areas. Cabinet glass wash uses an alkaline additive to give effective but economic cleaning. Cabinet Glass wash will leave all glasses and bottles clean and sparkling bright. Odorless and taint free this product is great for busy pubs, clubs and restaurants with quick, clean and effective results. Houses a powerful solution which removes yeast, residue and trace elements of beverages which build up within the plastic and stainless steel fittings of pumps, lines and dispensing pipes or valves within pubs, bars, restaurants and hotels. As an essential product for cleaning beer lines, this Jantex formula provides immediate results and rinses away easily, leaving your lines perfectly clear and free of any residue without any risk of damaging PVC piping.